Germplasm is the stuff that gives rise to an organism, and the USDA has set up repositories around the country to house various kinds of plants. Each repository is situated where a particular group of plants grows well. So Davis, California is home to the repository for figs, pomegranates, and Asian persimmons; Corvallis, Oregon is the repository for pears, gooseberries, and mint; and Geneva, New York, where I visited, houses the collections of apples and American-type grapes. (My own gooseberry collection helped build the gooseberry collection at Corvallis about 20 years ago.) Taking into account seed collections and other, related work, these repositories maintain over 20,000 accessions of plants representing over 300 species. Germplasm from these collections is available to scientist and other interested citizens, which is how I obtained grafting wood to make most of the approximately 2 dozen varieties of apples that I grow. So there I was — a fruitophile — standing with clipboard in hand and camera slung around my neck in in a field of apple trees, each one a different variety. My mission: Photograph and collect 3 to 4 samples of a couple of dozen varieties. What sweet labor! (I had previously contacted the repository staff and received permission). Up and down the rows I went, photographing, collecting, and, of course, tasting. Apples have been cultivated for so long and are so popular a fruit that it’s no wonder that such great variation exists in the fruits’ appearances and flavors. Flavors include anise-flavored Ellison’s Orange, sweet Mollie’s Delicious, spicy-tart Cox’s Orange Pippin, and everything in between and beyond. 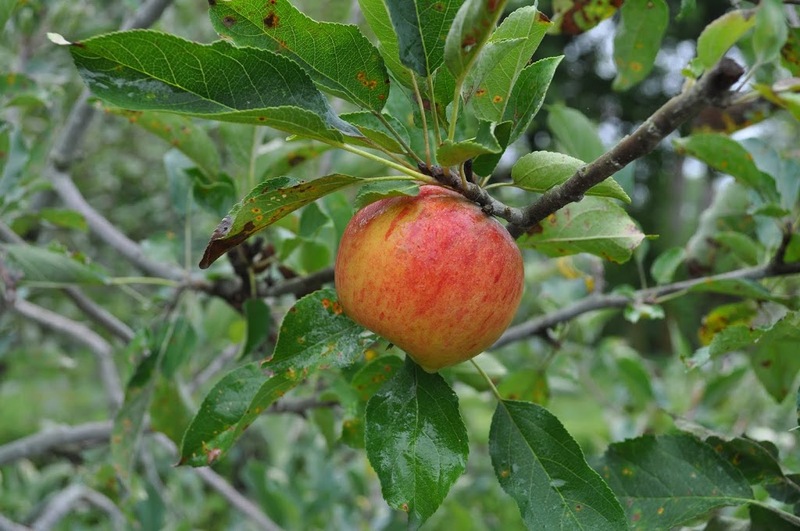 The range in color goes from gray-brown Pomme Grise to cheery red-splashed yellow King of the Pippin. And then there are variations in fruit size and shape and, less obvious, characteristics such as pest resistance, productivity, and cold tolerance. Most important, to me, is flavor. I should have brought a palate cleanser because after a while all the varieties were beginning to taste like . . . well . . . apples. Nonetheless, two varieties that I do not grow did stand out for flavor; I’ll be ordering grafting wood of Chestnut Crab and King of the Pippins to graft onto trunks of my Ingrid Marie trees once I lop her top off. After the apples, there were grapes to photograph and sample. Boy, would I love to tidy things up with some pruning now. The lilac bush would look nicer in coming months with those couple of tall, gawky stems cut off or back. Grape and hardy kiwi stems are reaching out all over the place, grabbing onto each other and anything else they can wrap around. The pear trees are developing a nice spreading form — except for watersprouts shooting vigorously skyward from the uppersides of some of the spreading branches. How nice it would be to cut these plants back now rather than in spring. The gooseberries and currants are very cold hardy plants and begin growth relatively early in spring. All of which makes a good case for pruning those plants now. Rather than prune, a good place to re-channel that “tidy everything up” energy is in the vegetable and flower garden. Cleaning up is one way to lessen pest problems next year. As I pulled out spent bush bean plants, I gingerly placed them into the garden cart and, from there, onto the compost pile, trying not to disturb the resident bean beetles. Those bean beetles had hoped to spend the winter on site, to emerge next spring and lay eggs on next year’s bean plants. I’m hoping to “cook” as many of them as possible in the compost pile. Tomato plants are looking a bit ragged even though they’re still bearing plenty of tomatoes for fresh eating. Gathering up all stems, leaves, and old fruits and composting them reduces the inoculum load out in the garden ready to infect next year’s plants. It’s not a question of eradication, which isn’t possible, but of balance. Cutting down old peony stems and composting them takes inoculum for next years botrytis disease off-site. Left to infect plants next spring, botrytis could keep peony flower buds from unraveling. As Charles Dudley Warner wrote over a hundred years ago (in My Summer in the Garden, which I highly recommend and is much more than a gardening book), “the closing scenes are not necessarily funereal . . . a garden . . . goes into winter-quarters . . . neat and trim . . . so that its last days shall not present a scene of melancholy ruin and decay.” Not everyone would agree. There’s also something to be said for the garden left a little wilder. It’s not for me, though.